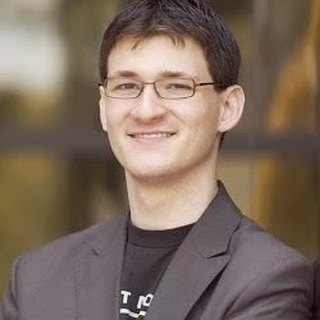 Dave Bell is the Co-Founder and Chief Executive Officer of Gummicube. In this role, Dave is responsible for overseeing the business strategy for the company, driving growth and market development. Dave is a pioneer of the mobile entertainment industry with more than 15 years of experience publishing, marketing and distributing mobile applications and games across carrier, direct to consumer and app store channels. In this post, he shares his ideas on ASO tips for the app developers. Apple’s App Store and Google’s Play store are overflowing with millions of apps, forcing developers to look at new methods to stand out in the crowd. App developers are constantly fighting for attention and trying to make their app more visible to convert users and increase existing ratings. The simple way to capture users is through App Store Optimization (ASO), the process of improving an apps’ discoverability in the app stores. With nearly 70 percent of downloads coming from searches within the app stores, developers need ASO to stand out against competitors and understand what users are looking for. ASO is critical to the foundation of mobile app marketing, and gives a better understanding of how to improve an app’s metadata to become visible in the app stores and convert more users. There are simple steps to making a bullet-proof ASO strategy, and the steps are simple for any app developer to take advantage of. ASO, while it may seem daunting, is simply the process of optimizing mobile apps to rank higher than competitors in the app stores. Getting an app discovered may seem incredibly difficult, especially considering that there are over 2 million apps on the market. However, one facet of implementing an ASO strategy understanding how apps currently rank compared to their competitors in search results. Developers need to understand that the app stores are still the largest channel for users to find and download apps. Several sources estimate that search makes up at least 50 percent of mobile app downloads, and is predominately driven by searching through the app stores. Apps need to be visible to convert users, but if its metadata (title, description, screenshots, etc.) does not lend itself to making it discoverable, then loses out on being seen by more users. 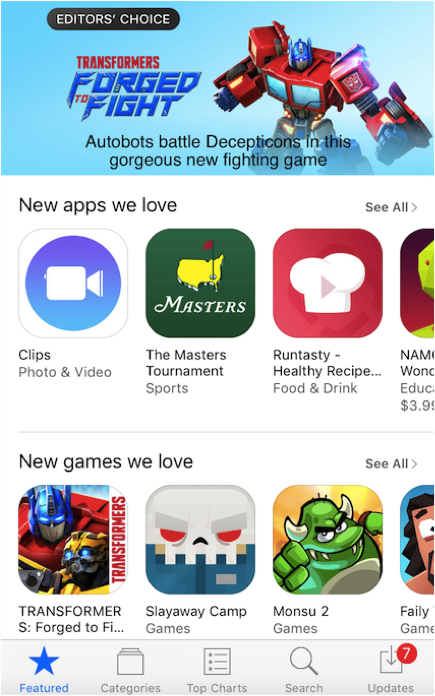 Graphic of current Apple App Store displaying featured apps. ASO breaks down the main factors that go into making an app more discoverable, and that is by improving the app’s title and keywords. The app’s title is important because while it is a piece of metadata, it is primarily used for converting users. 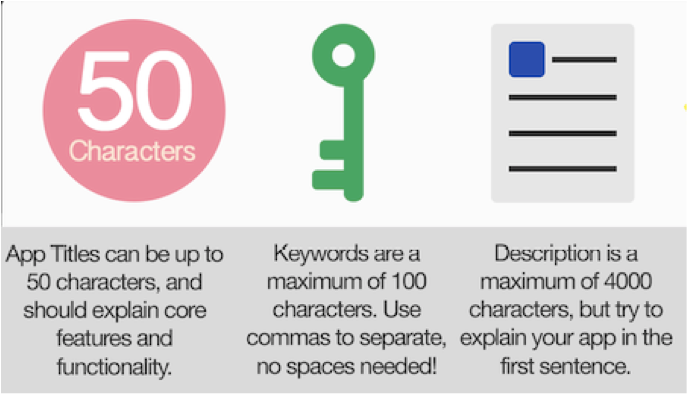 Keywords are used in the app’s title because it gets the heaviest amount of search traffic. Many times, developers do not want to change the app’s title, unless it means including more title tags or keywords to improve its visibility. The keywords used in the title, and throughout the metadata, need to be unique and relevant to the app all while targeting the audience. Developers need to spend time researching which keywords are unique to the app based off user trends and behavior. The keywords are necessary to an app because they improve its search rankings and can be used to monitor how competitors’ rankings as well. Besides the keywords and app title, two other pieces of creating an ASO strategy are paying attention to overall number of downloads and ratings and reviews. Downloads, while this is often saved for after the app’s metadata has been improved, should be monitored to understand the overall growth. Ratings and reviews tell developers how the app is doing, and with the ability to reply to disgruntled or upset users, developers can now take this as another opportunity to improve their app’s overall rating. While this covers the basics of ASO, there are more in-depth steps that will help developers increase an app’s search ranking. Developers need to pay attention to these simple steps to understand what needs to be done to improve an app’s metadata and increase its visibility. One of the biggest steps developers can take is using keywords throughout the app’s title, description, screenshots and video to make the app more discoverable. Not only will this help explain the app’s functionality and features, it will also help the app become more visible and relevant to users. Before developers dive into an ASO strategy, there is basic information developers need to know about the two app stores regarding what is allowed for their app’s metadata. In the App Store, developers have 100 characters for their keyword bank and 50 characters for the title. In the Google Play store, the title is limited to 30 characters but developers have an unlimited number of keywords accessible to the app. 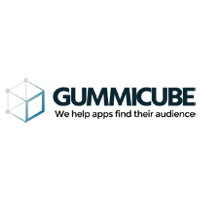 Graphic taken from Gummicube’s App Store ASO Infographic. The first step to any successful ASO strategy is improving the app’s metadata, and that starts with the title. It is worthwhile to place keywords in the title, especially keywords that help emphasize the app’s core features. The title and keywords need to be chosen with the app’s audience in mind. When the title is relevant to the audience, and contains keywords that apply to user searches, it incentivizes users to convert. Once the app’s title has been decided upon, the keywords can be finalized and then used throughout the app’s description and other creatives (screenshots and video). Despite the title and character limit differing between app stores, both allow a 4,000-character limit for an app’s description. The description is important because this is the largest area developers have that can build relevancy with keywords and explain the app’s core features. When it comes to an app’s creatives, screenshots and video are a huge selling point because they give the user a visual look at how the app will function. It engages with the user, captures their attention and drives users to convert. The screenshots and video need to be appealing while showing what users can do on the app, whether that be anything from gameplay to shopping, and contain relevant keywords just like the app’s title and description. 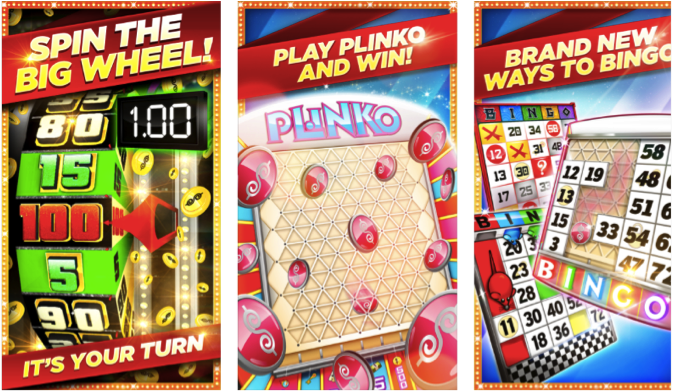 Screenshot example of “The Price is Right™ Bingo” app. While the app’s title, description, screenshots and video are all incredibly important pieces of the metadata, another piece developers can focus on is the app’s icon. The icon is responsible for communicating the app’s core features and making a good impression. Besides the app’s title, the icon is often the first things users see. 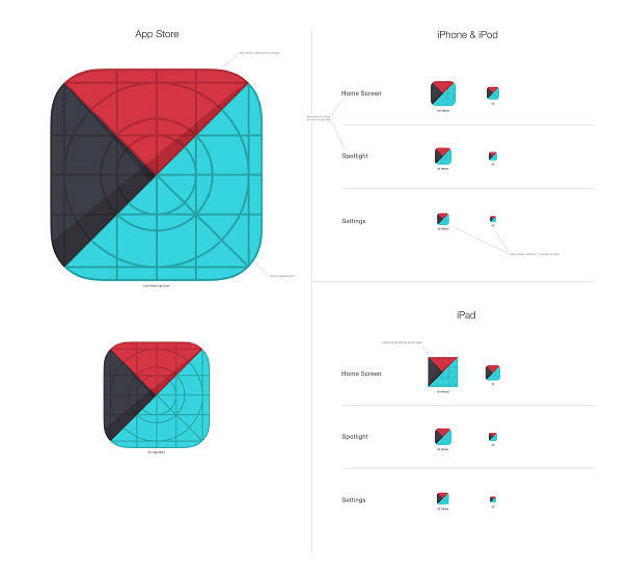 The app icon needs to stand out against competitors and be unique without being overcomplicated. Pay attention to competitor’s icons or do focus groups to see which would get the best ratings. For developers in Google Play, they can conduct A/B tests to gage previous icons, screenshots and titles to see if changing them is a necessary step in increasing their ratings. With over a billion mobile users and 2 million apps available on both app stores, developers need a strategy that will increase their visibility and conversion rates. Having a bullet-proof ASO strategy is the only way that developers can successfully maximize their app’s growth and compete in the app stores. Developers need to understand that their app’s title is the most important piece of metadata followed by the keywords, which build relevancy through user searches. The app’s description is another integral part of improving the app’s visibility, while the app’s icon, screenshots and video are to help improve conversion rates. ASO is the only marketing strategy developers should use to improve their app’s ratings, overall discoverability and metadata. This entry was posted in App Store Optimization, Mobile Apps Marketing and tagged app store search, ASO, aso strategies, mobile app, user acquisition. Bookmark the permalink.